Lena (Kuipers) Van Essen Vanden Bosch was born to Peter and Hattie Kuipers in Pipestone County on February 1, 1924. She attended the country school and graduated from the 8th grade at Edgerton Christian School. Lena married Raymond Van Essen on December 3, 1944. Together they farmed east of Edgerton for 41 years, moving to their home in Edgerton to enjoy retirement in 1986. Lena served her Lord, family, church, and community well. She was a member of Christian Fellowship, Martha Circle and Legion Auxiliary. She was a Friendship Class mentor and served on the Southwest High School Circle. 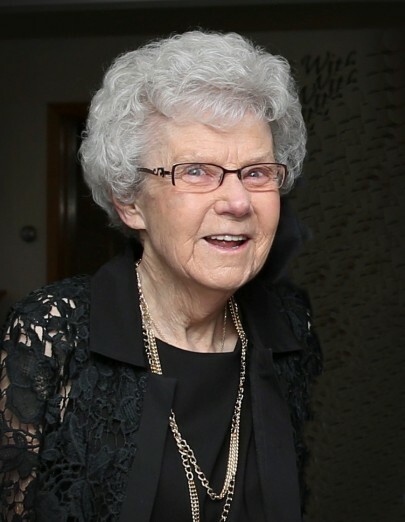 Lena was a member of the First Christian Reformed Church in Edgerton all of her life. Lena did housework at various homes and worked as a clerk at a grocery store and meat processing plant in Chandler. Lena did woodworking for many years and worked at Edgebrook Care Center. She loved her grandchildren and great-grandchildren, made quilts and baby blankets for them and was a gifted seamstress. She also enjoyed gardening and yard work. Raymond passed away in 1990 after 45 years of marriage. Lena and Tom Vanden Bosch were married in July, 1994. He passed away in 2007. She is lovingly remembered by children, Sherry (Earl) De Wilde of Holland, Minnesota, Bob (Karen) Van Essen of Edgerton, MN, Dave (Leanne) Van Essen of Lebanon, Oregon, Sandy (Bruce) Gilman of Caledonia, Michigan; step-children Tom Vanden Bosch of Sioux Center, Iowa, Gene (Gloria) Vanden Bosch of Northfield, Minnesota, (Virg) Christoffels of Sioux Falls, South Dakota; 17 grandchildren; 32 great-grandchildren; 9 step grandchildren; 19 step great grandchildren; two sisters: Effie Bolt, Grand Rapids, MI, Celia Moret, Ripon CA; one brother, Adrian (Caroline) Kuipers, Edgerton, MN; sisters-in-law and brothers-in-law; Jennie Van Essen, Clarence and Hennie Van Essen, Henry and Dot Van Essen, Joyce and Marvin Bruxvoort, Wes and Jean Van Essen; and many loving nephews and nieces, great-nieces and great-nephews. Lena was preceded in death by her parents, her husbands, Raymond Van Essen and Tom Vanden Bosch; brothers, John, August, Cornie Kuipers; sister, Florence Kallemyn, sisters-in-law; Jeanette Kuipers, Betty Kuipers, Ruth Kuipers, Ella Kooiman, brothers-in-law; Harris Kallemeyn, Roger Moret, Ralph Bolt, Jack Kooiman, Nelvin Van Essen; step daughter, Cheryln Christoffels and step daughter-in-law Carol Vanden Bosch.